Cats seem to be creatures of leisure. They sit on your windowsill looking out at the birds and squirrels and you certainly don’t see them dash around like dogs do. However, this doesn’t mean that they don’t need to be mentally and physically stimulated. They do, but this is more difficult with indoor cats. Out in the wild cats will hunt. This isn’t just for fun; it is for survival. Mother cats will teach their kittens how to stalk and trap prey. It is their basic instinct and this instinct does not disappear when cats are kept indoors and are well fed. They have to be stimulated and one of the ways to do this is by giving them toys. So, what benefits are there from giving your indoor cats things to play with? Apart from encouraging their natural instinct, it keeps them healthy through exercise and stops them from putting on weight. 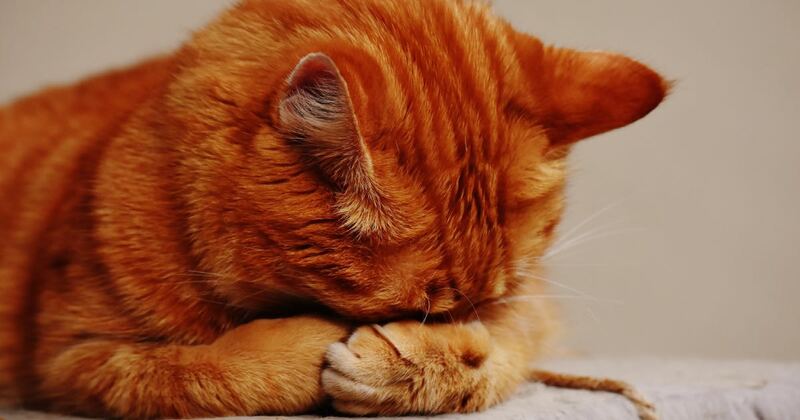 It also helps to relieve boredom which can set in if your cats are exclusively indoors. 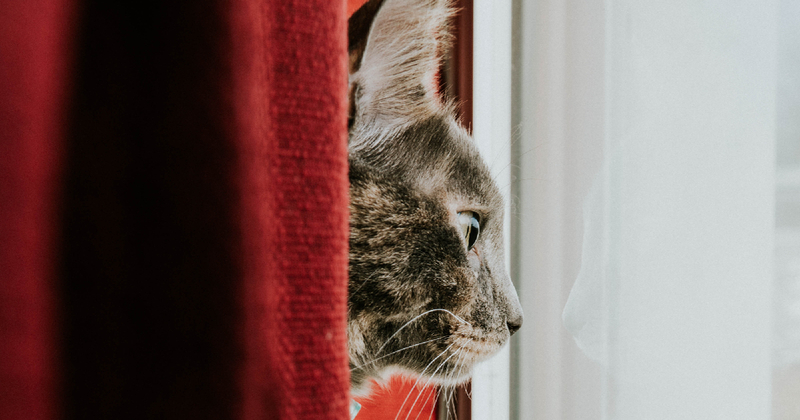 If you also play with your cats from time to time, it will increase your bond with them and probably lessen any behavioral problems that they might have. This doesn’t mean that you have to purchase a whole range of play things. There are inexpensive toys out there so buy a few and put them in different parts of the house. In this way, your home will turn into a cat playground. Perhaps you’re not sure what toys to buy for your cats. Well, we are here to help you. 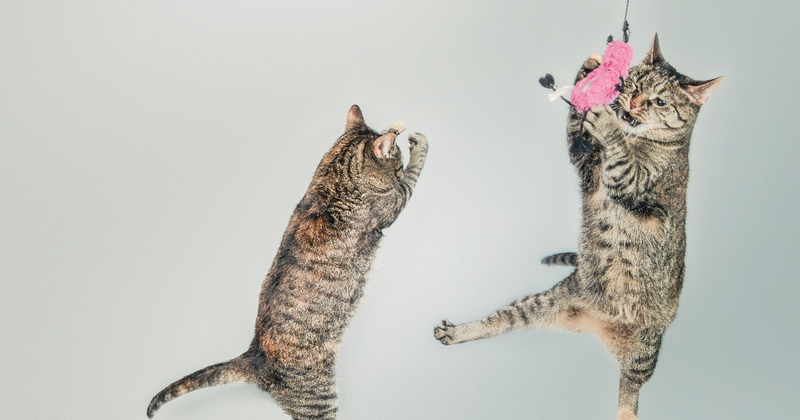 We are going to give you our top 10 best cat toys out there. 10" x 10" x 2.6"
23.5” x 23.5” x 3.2"
15.7" x 11.8" x 3.3"
This is a great interactive toy which is why it has gained top spot. Your cats can play with it together and even you can join in the fun. In addition it has more than one function. It is a round toy with a mouse on a track, but it also has a scratching pad on top. Your cats can have fun playing as well as sharpening their claws which should take them away from scratching your furniture. Once your cats touch the mouse it will rotate around the track causing many hours of fun as they chase it round. In addition, the exercise will be good for them and it will also decrease boredom. The toy is made out of Shell environmental PP material which is totally safe for your cats, a very important factor when choosing toys. This take our number two spot because it is such simple fun for your cats, but it can keep them amused for a long time. 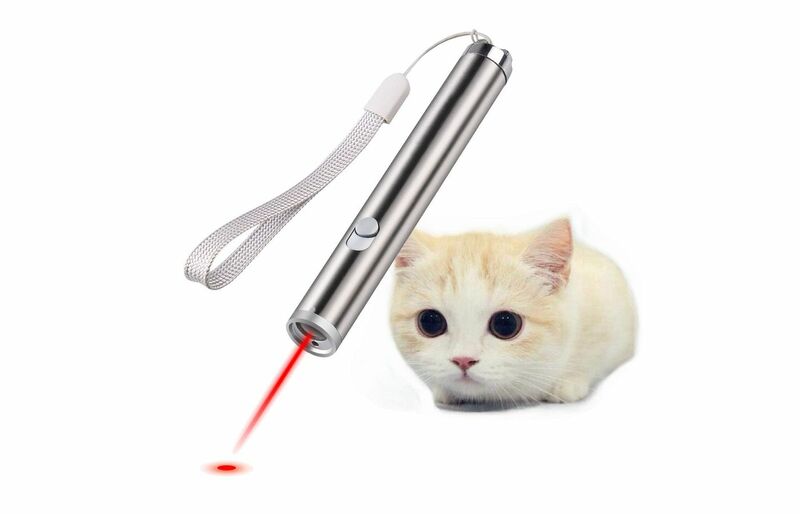 Who could believe that a laser light would give your cats so much fun? However, it has been proved that cats love to chase around a laser. This laser light works on just about every surface, both day and night. It gets your cats running around the room chasing the light which is great exercise for them, though not for you as you can do this from the comfort of your armchair. It is a good idea to end the play session with a toy that your cats can get hold of physically. It is satisfying for cats to have a trophy at the end of a chase. This is an amazing package and couldn’t be left off our list. 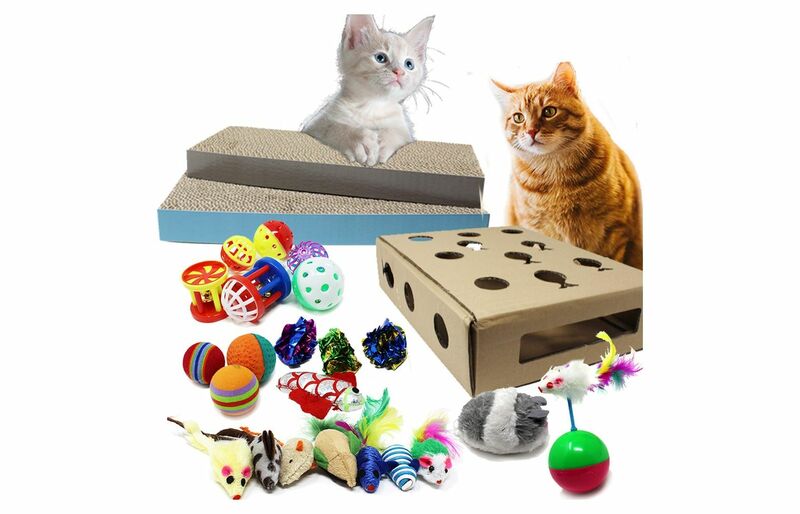 You get 24 toys for your cats to play with at a very reasonable price. The set includes a collapsible tunnel, an interactive feather toy, a cat teaser wand, a fluffy mouse, and different types of balls. There are plenty of choices for your cats to play with when they are on their own and when you’re there, you can join in the fun as well. These toys provide hours of fun and exercise for your cats, and when you’re at work you’ll know they’ll have things to do to combat boredom. 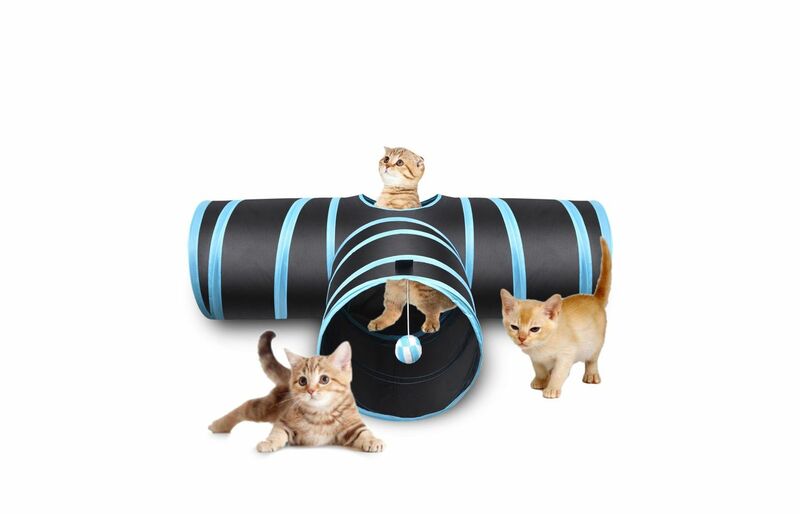 If you are looking for engaging entertainment for your cats you won’t go far wrong with the Creaker 3 Way Cat Tunnel. It will give your cats hours of fun and exercise, hopefully keeping down their weight. The toy is comprised of three connecting tunnels, crinkle cracker paper, a peephole, and a toy ball. Cats love to hide so these tunnels are perfect for them. In the wild cats always look for places to keep away from predators and this instinct doesn’t go away in domestic cats. In this 3 way tunnel your cats can escape into a cozy environment when they want to get away from the other cats or they simply want to feel warm. The toy is made from extra strong tear resistant polyester which is wrapped around a spring-steel frame. It’ll take a lot for your cats to destroy this. 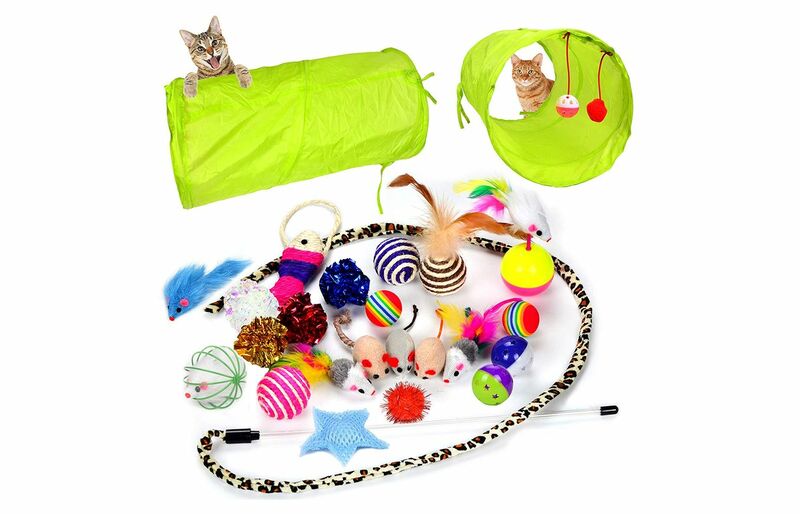 Why not add some extra toys into the tunnels to give your cats more fun? Cats always love furry mice and balls to play with. 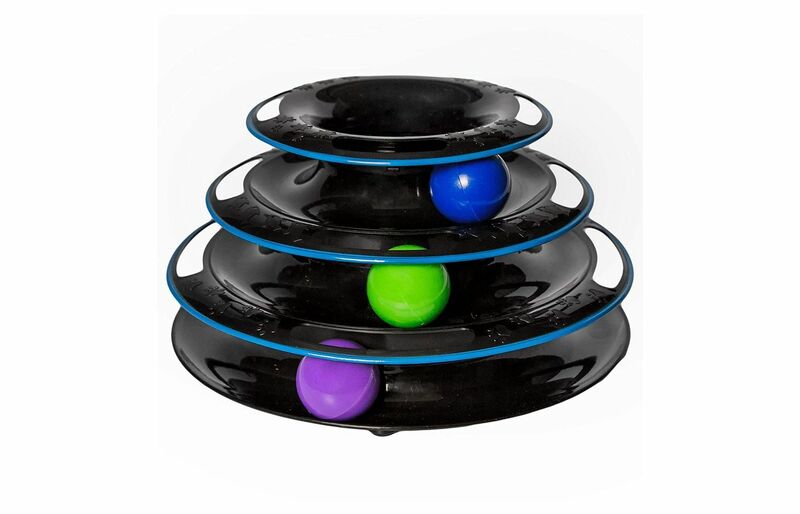 If you are looking for interactive fun for your cats you won’t go far wrong with this 3-level power ball and track. It suits a multi-cat household and will keep them entertained all day. 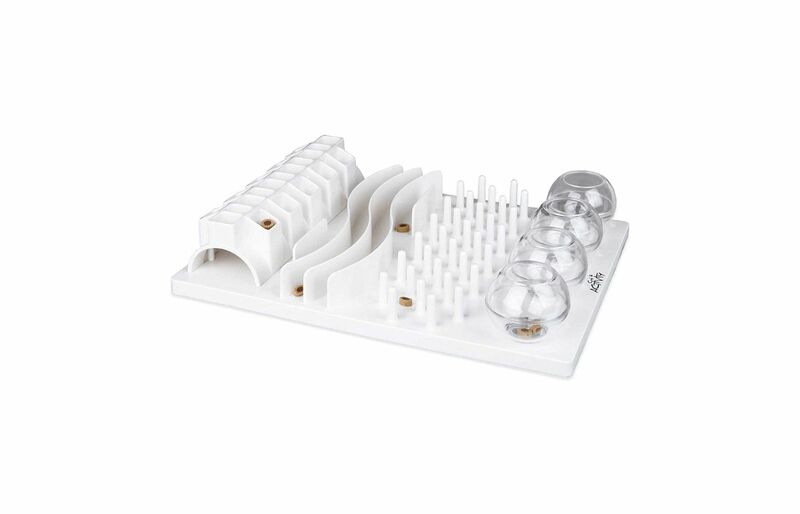 There is a ball on each level and your cats will enjoy trying to get each one out. For them it will be like chasing natural prey as if they were out in the wild. The toy is made out of heavy duty ABS plastic material which is able to withstand rough play. This is a fantastic interactive puzzle for your cats. It’s basically a box with holes in it through which your cat can retrieve toys and treats. The box comes with 2 scratching pads, a cat interactive hide and seek puzzle, and another 24 toys. Add some edible treats for extra enjoyment. It is suitable for a multi-cat household as there is plenty of room for more than one of your cats to play. The box is made from reinforced and sturdy cardboard and will last a long time. If you are looking for incredible value you have come to the right place. This is a great bundle. Enclosed in the package are colorful toy springs which your cats will have great fun chasing around the room. 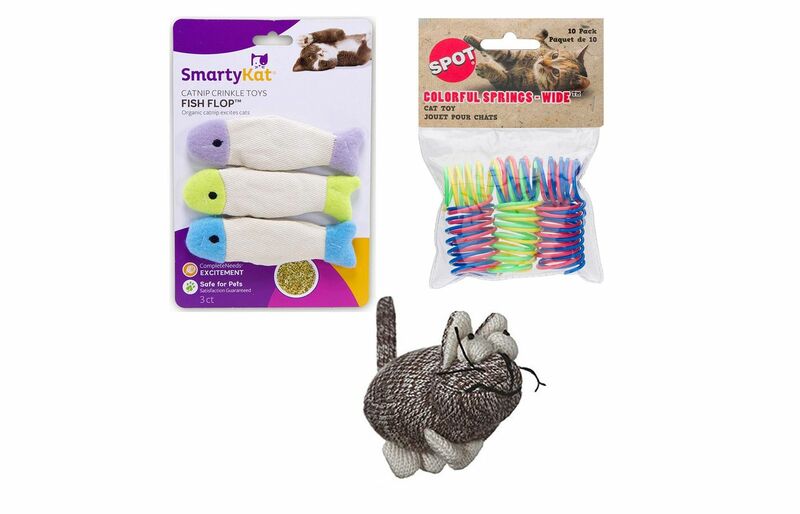 There are also 3 Smarty Kat catnip Fish Flop crinkle toys. Your cats will go mad for these. They are the perfect things to bat, bite, and throw around. Lastly, there is a 3” x 2" Multipet mouse sock pad while will delight your cats. They can pounce on it or chase it, both of which will help to relieve any stress that they have. 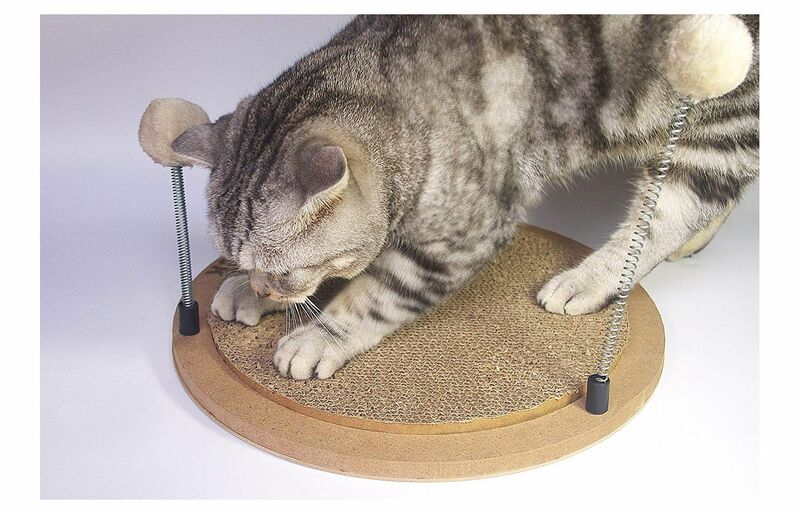 Another brilliant invention as it serves as both a scratcher and a toy. It is a round scratching pad with three plush spring balls for your cats to play with. They can amuse themselves with the balls and then have a good scratch. The result is that your cats will be entertained, while your furniture is saved. 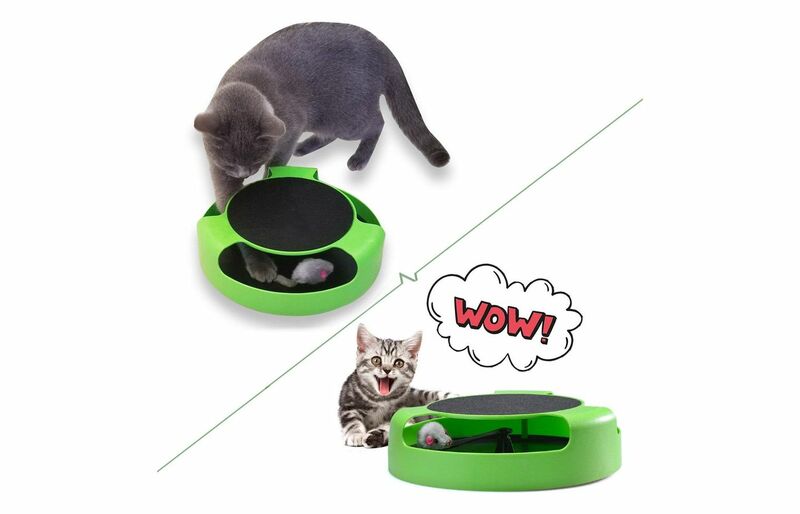 This is an ingenious toy which will keep your cats entertained for hours. 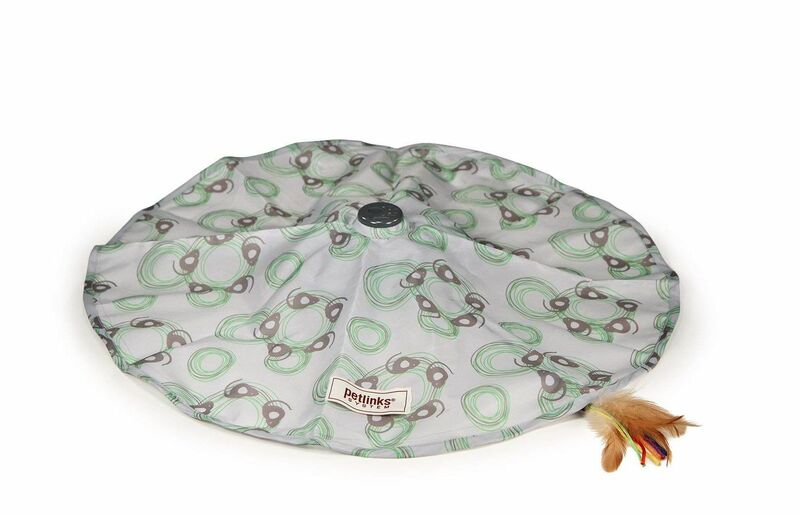 It is a mat which spins a set of feathers around so that your cats can pounce on them. It replicates the thrill of the chase where cats are out in the wild hunting mice and rats. It is operated by batteries and the control box is in the center. There is a choice of four speeds including a random one so your cats can have some variety. It is very easy to clean. Just wipe the outside with a moist towel and then air-dry it. Cats love treats and this toy merges playing with eating. If you have fat cats this might encourage them to get some exercise. 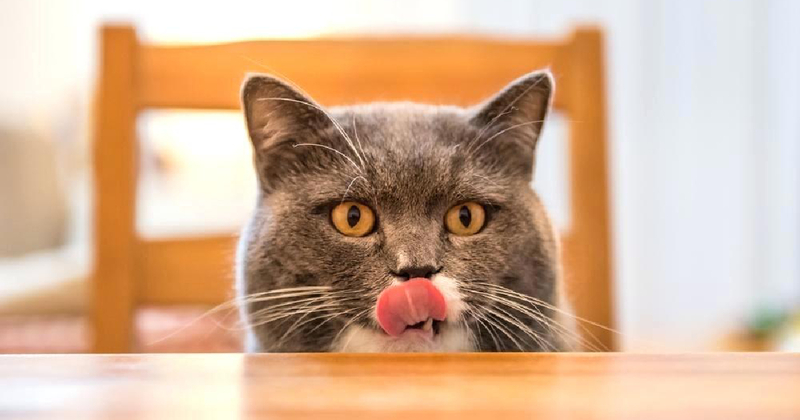 Nothing is better for cats who love food to have to strive to get their treats. So how does this work? Well, it’s like a board game with five different ways of retrieving treats. Your cats will be intrigued by the snacks placed on the board and will want to work out how to get them out. 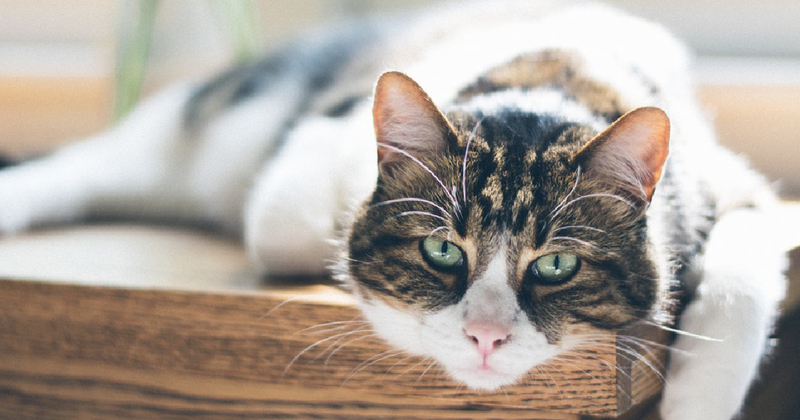 There are five different ways for your cats to get their treats. For a start, there is a tunnel. In here you could put snacks, but you could also put in a catnip toy which will delight them for hours. The top parts probably aren’t big enough for your cats to get their paws into, but you could put in a special drink like cat milk. There are alleys which will encourage your cats to lie down and wriggle. 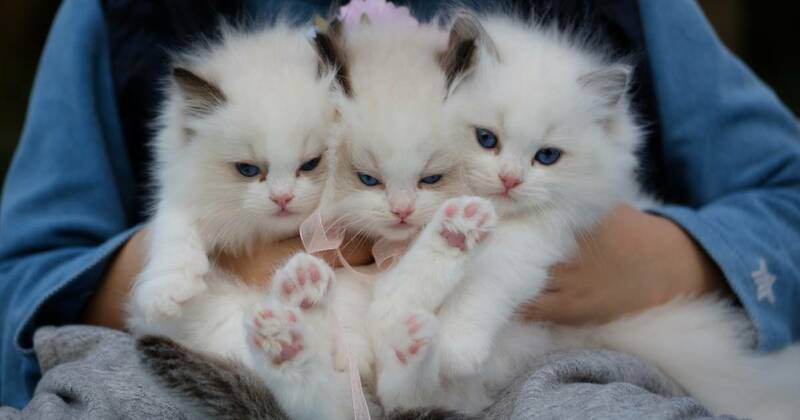 If they can’t get the treats out by using their paws, their claws will probably do the trick. Put some treats in among the pegs. 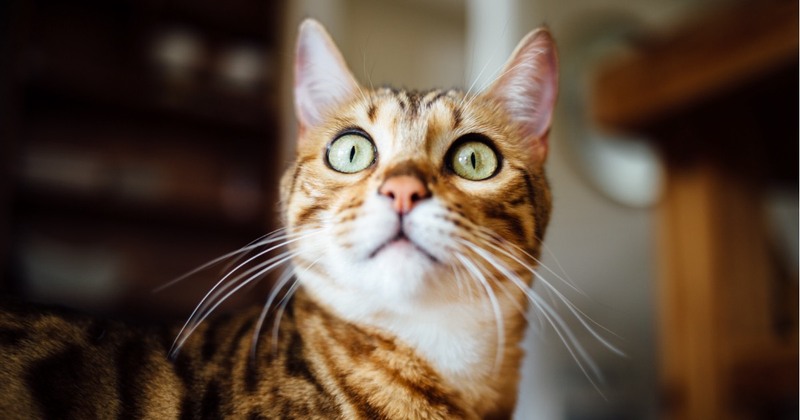 Your cats will see these from a little way away and it will give them the opportunity to plan how to get the treats out. This has the added benefit of stretching the imagination of your cats. Finally there are little globes which look like fish bowls. This is a great place to hide treats as your cats can get their paws in these and pretend that they are fishing. Why Should I Play with my Cats? The easy answer to this is that it creates a bond between you which is the ultimate reward. Playing with your cat means that they will associate you with having fun and they will want to spend more time with you. It’s lovely when one of your cats decides to lie on your lap after playtime and starts purring. Why do Cats Need to Play? Cats are natural killers. Out in the wild they will stalk their prey silently before they pounce in for the kill. You can’t take this natural instinct out of a house cat, but you can provide them with toys which will replicate hunting. This will help to decrease any stress that they have and also keep their weight down. An overweight cat can have all sorts of health problems so this is a great way to help avoid them. What are the Alternatives to Shop Bought Toys? Some cats just don’t take to shop bought toys, so what do you do? Everybody knows that cats love cardboard boxes so let them play in them. It’s simple, but they find it fun. You could even cut some holes into a cardboard box and put some treats in for them to discover.